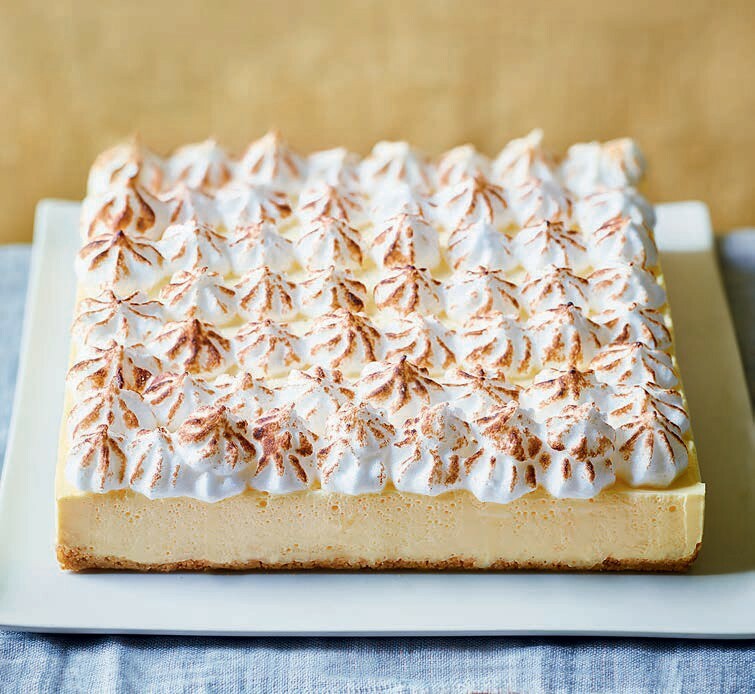 Gingery biscuit base, luscious lemon filling, fluffy meringue – layers of loveliness! 1 Soak the gelatine in a bowl of cold water for 10-12 minutes, or until softened. Meanwhile, line the base of a 20cm square, loose-bottom cake tin with baking paper. 2 Mix together the spread and biscuits and spoon into the tin, pressing down with the back of the spoon to make an even layer. Freeze for 10 minutes. 3 Put the lemon juice in a small saucepan, bring just to the boil, then remove from the heat. Squeeze the water from the softened gelatine and add the gelatine to the lemon juice. Stir until dissolved, then set aside to cool. 4 Whisk the quark, soft cheese, lemon zest and 3 tbsp sweetener in a bowl until smooth, then stir in the cooled lemon juice mixture. Add a few drops of yellow food colouring, if you like. Pour evenly over the biscuit base and freeze for 20 minutes, then transfer to the fridge for 6-8 hours, or until set. Remove the cheesecake from the tin, peel off the baking paper and place on a serving plate. 5 When ready to serve, beat the egg whites in a large, clean glass bowl until they form stiff peaks. Add the remaining sweetener and whisk until smooth and glossy. Spoon into a piping bag fitted with a star-shaped nozzle and pipe over the cheesecake in small, even peaks. Finish by lightly browning the top under a medium-high grill or using a cook’s blowtorch. Cut into 9 equal-size squares to serve.